The Vollstedt family has been running a butcher’s shop since 1862, but always in Haderslev only. 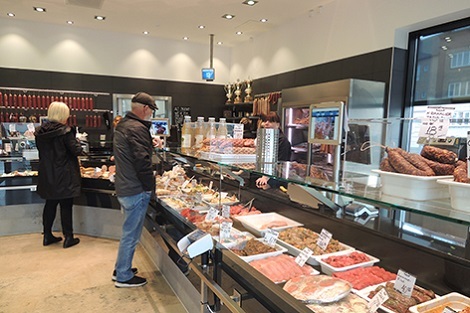 Now the Vollstedt family has made the leap and opened a new butcher’s shop in Kolding, just next to the national baker chain of Lagkagehuset. 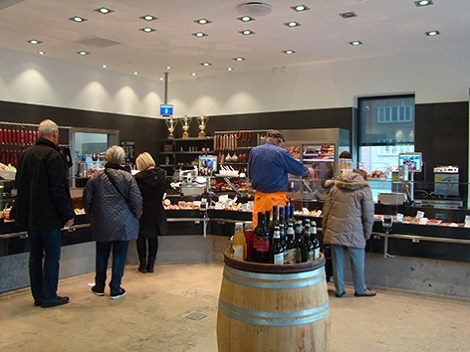 The new shop opened on 15 September 2015 with more or less the same range of products as they had in the Haderslev store. Having run the butcher shop for five generations and through 153 years, they know what customers are looking for. Scanvaegt Systems supplied new DIGI SM-5500α modular PC based scales to both shops at Haderslev and Kolding. This means that the weighing and printing unit, and the displays can be separated. With the SM-5500α modular, it gives the shop assistants excellent ergonomics and working positions as they are at “eye-height” with the customers. The customer can also follow the large 12.1 inch customer display which will display weight and price information as well as recipes, product information and a video showing promotions at the butcher shop. These scales also come with an integrated queue system. A queue number printer is placed at the entrance and a queue number display is placed at a visible location in the store. With this system, it benefits both customers and staff. It will show which customer to be served and direct this customer to the available scale. The queue ticket will also display the estimated waiting time for each customer. With this information, customers know when they can expect to be served and they can browse around the shop while waiting. All these contribute to the increase in sales and provide a good shopping experience for the customer.